“The Law and Practice of Trademark Transactions: A Global and Local Outlook” addresses the challenges posed by the territorial nature of trade mark law in the international market. 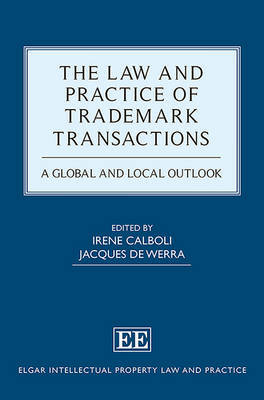 The book is divided into two sections; Part 1 – Trademark transactions in the global marketplace and Part 2- Trade Mark Transactions at the Regional and National Level. Part 1 examines strategic use of trademarks and is particularly helpful to practitioners as it addresses problems which may arise when contracting for trademarks. Each part is further subdivided into themes. Part 2 is useful for those interested in acquiring an understanding of how trade mark law operates in specific areas, namely; the EU, the UK, Germany, France, the US, Brazil, China, Japan, ASEAN and India. Section B: Strategic Considerations, focuses on how to make the most out of trademark assets. Chapter 3, written by copyright expert Jane Ginsburg, examines the overlap between copyright and trademark rights in visual characters. It considers what happens when a character falls into copyright public domain, the creation of derivative works, the reversion of the copyright in the character to the author and redesigning trademarks as copyrightable characters. Chapter 5, by Gregor Bühler and Luca Dal Molin advises on the procedure that should be followed when a company sells a brand division but wants to continue using the trademark in other existing divisions. Section C focuses on Valuation, Taxation, Security Interests and Bankruptcy. Chapter 7 by Roy D’Souza will be useful to those interested in the aforementioned Chapter 5, as it focuses on brand valuation strategies. The last Section in Part 1 looks at Dispute Prevention and Settlement Mechanisms. In Chapter 12, Dai Yokomizo instructs that choice-of-court and choice-of-law clauses in international trademark transactions are often uncontentious. In the event of a dispute, Jacques de Werra (editor) presents routes for resolution, with a focus on arbitration, in Chapter 13. Part II considers trademark transactions in different regions and is divided accordingly. The editors, Irene Calboli and Jacques deWerra have done a great job in ensuring that a range of practical topics are covered. In light of recent events, Chapters 14 – 17 which examine trademark transaction in Europe, will be of particular relevance to readers. Publisher Edward Elgar has offered a generous 35% discount to IPKat readers. Once the book is in your basket, enter CALB35 in the discount code box (after delivery details).